Nutrition, both on the bike and off the bike, is important to ensure you get the most from your cycling. Mallorca Cycling Tours has selected 3Action Sports Nutrition products to use on their cycling tours, holidays and camps. The comprehensive range of sports nutrition products has been carefully designed and includes many gluten and lactose free items. The Anti-cramp formula is based on the inclusion of the appropriate minerals in the products, ensuring that muscles are able to function correctly. Palatinose (Isumaltulose): Palatinose is a “slow release” sugar which is fully absorbed in the small intestine as glucose and fructose. The result is a steady provision of energy, preventing the typical energy peaks and troughs which can result in the feared “bonk” and abrupt hypoglycemia. Palatinose does not raise the blood-sugar levels and also has the benefit of a not giving the sticky sweet taste which is an all too common characteristic of many sports nutrition products. pH-Control: Many nutritional supplements provoke digestive problems (stomach ache, diarrhoea etc.) In particular, isotonic drinks must be kept cool as they can produce a “laxative” effect if they are allowed to warm up. The reason for this is the high degree of acidity. The pH of 3Action products is strictly controlled with the result that the Energy Drink has a neutral pH. The result is that 3Action products are easily digestible and avoid any type of stomach discomfort or other negative effects. Such is the control of the pH that both the Sports Drink and Energy Mix can drunk warm, like tea. This is particularly important factor in warmer climates such as Mallorca. 95% of the content of each one of our products is absorbed by the body so that it is not over-loaded by nutrition that the body is not going to use. The majority of 3Action products are gluten and lactose free providing an excellent sports nutrition option for those with intolerances or following specific diets. 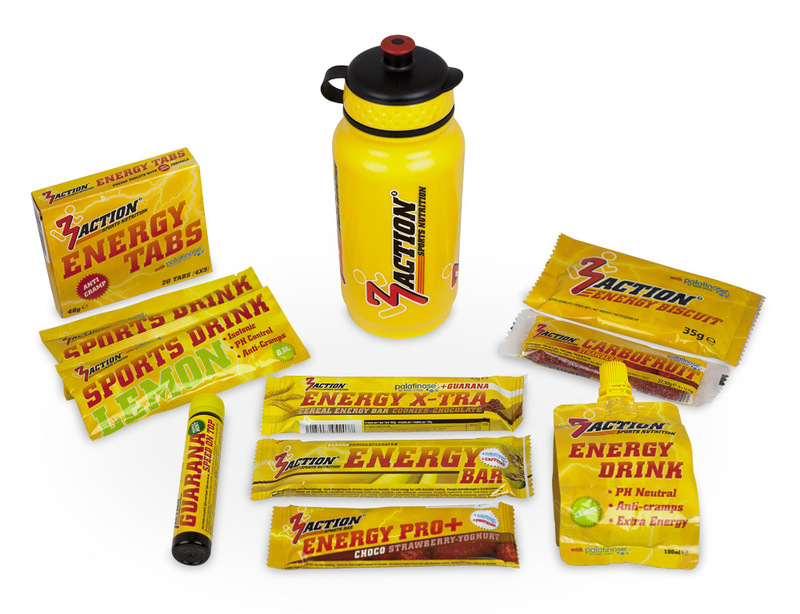 In addition, the 3Action product range contains some unique products as an alternative to the traditional energy bar. The novel jellies and nougat products offer the same nutritional value in handy mouth size pieces as well providing variety of taste and texture.